While Australia and the United States are currently centre stage on the worldwide racing scene, thoughts will also turn to the Dubai World Cup on Friday as the UAE season kicks off at Jebel Ali. World Cup day at Meydan on March 25 will conclude a campaign that begins with a six-race card featuring jockeys Chris Hayes, Pat Dobbs and Richard Mullen. Jebel Ali will host 11 meetings this season, staged every other Friday afternoon, while Meydan hosts 20 fixtures, with the World Cup carnival beginning on January 5. Both those tracks stage almost exclusively thoroughbred racing, whereas the other three courses, Abu Dhabi, Al Ain and Sharjah, offer just one thoroughbred race per meeting, with purebred Arabian action dominating their fixtures. The purebred Arabian races can prove crucial in determining champion jockey and trainer. Ernst Oertel was top trainer three seasons ago with 46 winners, 39 of whom were purebreds, while last season Tadhg O'Shea was champion jockey with 30 purebred victories among his total of 45. O'Shea is again the man to beat, while Doug Watson looks sure to mount a strong defence of his trainers' crown. Hamdan Al Maktoum has been champion owner for the past 11 seasons and is likely to make it 12. The first of Sharjah's six meetings takes place on Saturday, with Abu Dhabi's 15-fixture season starting Sunday week. Al Ain hosts the first of ten meetings in three weeks' time. Of interest for British and Irish connections will be the increase in minimum prizes for carnival races, which is now $100,000. The main change in terms of race conditions is the increase in distance, from five furlongs to six, of the Group 1 Al Quoz Sprint on World Cup day. 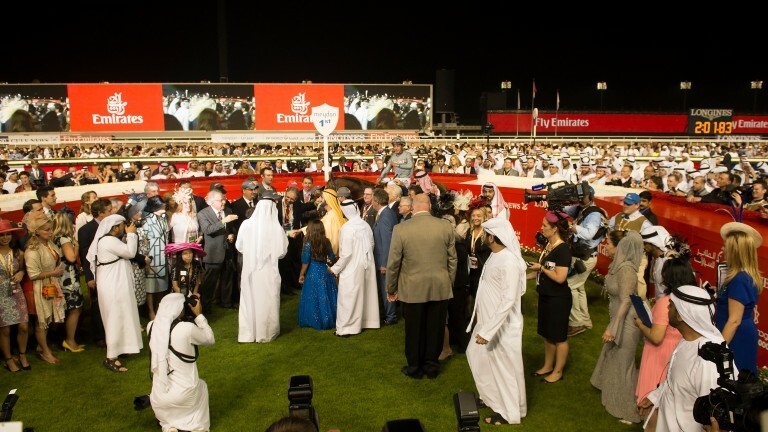 This has led to the introduction of the $200,000 Nad Al Sheba Turf Sprint, over the same six-furlong turf course and distance, as a prep race on Super Saturday. George Buckell is embarking on his third UAE campaign and will be looking to continue the progress he made last season, when he partnered 12 winners. Based with Musabah Al Muhairi, he has proved himself competent riding Purebred Arabians and registered a notable double in December 2015, landing the fillies' and colts' Classics restricted to purebreds foaled in the UAE. He returns having ridden a personal-best ten British winners this year. Cameron Noble is a new face locally and joins ex-champion and UAE stalwart Richard Mullen at Zabeel Stables with Satish Seemar. Recent apprentices at Zabeel include Hector Crouch, Marc Monaghan and a certain Ryan Moore. Seemar is very supportive of young jockeys and not scared to utilise their claim at the carnival or even waive their allowance in Group and Listed races. His 11 winners in Britain this year were achieved at a healthy 12 per cent strike-rate. Adam McLean is another local debutant and, based with Doug Watson, should enjoy plenty of opportunities supporting Pat Dobbs and Sam Hitchcott in a yard certain to have multiple runners in many races throughout the campaign. He shares an agent with the likes of Paul Hanagan and Dane O'Neill, and will be looking to gain experience and profile to give his career a lift, having come to prominence in 2014 when enjoying a big Saturday win on Top Boy at York.